Gräciõ's LäveñderBliss Café: Gracio's FIRST Successful Steamed Cake In Her Entire Life! Gracio's FIRST Successful Steamed Cake In Her Entire Life! NEVER would I thought that I would succeed in steaming this!! YIPEE!! Shucks, I think Im gonna be hooked on baking very soon. Haha! This is my 1st cake that I set my hands on after I got my mixer. Indeed, that Philips mixer did help me alot, tho it's rather heavy and my right hand was aching like crazy. I think it's time for me to get a steamer. This so called 'steamer' that Im using, is rather bad. I used a pot to steam, and this pot, is rather lousy. Time to get one real soon. heh heh. This cake has been on my "to do list" for quite a while. I tried making this earlier on but failed. Finally, the long awaited moment of success has come. Credit goes to Jesus & my mixer. Hehe!! I was glad that it turned out well, but alittle dense in the inside, not super spongy though. 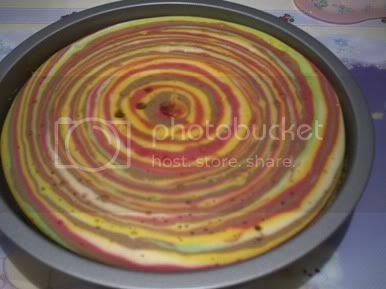 But at least this looks like a cake to me. haha! the last few times was ultimately bad. Hehe..
Another thing that I was amazed & surprised was that the colour layering came out rather pretty & even. 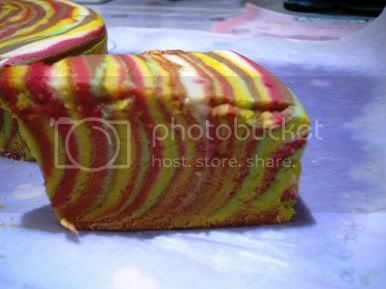 It's amazing how a batter can be transformed into a beautiful cake after much beating. Was just wondering who ever invented this thing called cake in this world. Haha! Ok, the top part's a little ugly cuz I went to poke 3 holes to check whether the middle part is fully steamed.